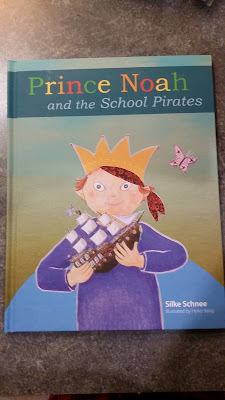 We were recently given the opportunity to read a book called Prince Noah and the School Pirates by Silke Schnee and Illustrated by Heike Sistig. We received it for free in exchange for our honest opinion. All opinions are 100% ours. I believe the age range for the book is 3 - 9 years old. My daughter is just on the top edge of the recommended age group, but she still enjoyed it. Before I left for vacation, she and I were able to sit together in a rocking chair and read it together. Truthfully, that's something that doesn't happen much any more. I was happy we were given the opportunity to try out this book, if for no other reason than the opportunity to slow down and read together! I never read the author's original book The Prince Who Was Just Himself, so I was new to Prince Noah. Prince Noah is based on the author's real life son, who has Down syndrome. "Prince Noah may be a little slower than others, but he has no less joy in living and learning." "It's time for young Prince Noah to go to school. In his kingdom, children go to school on sailing ships. There is a ship for girls and one for boys, one for children with an eye patch and one for children with one leg, and one for children who don't learn as fast. No one knows why there are so many different ships, but it has always been that way. Then a terrible storm drives the ships into the hands of pirates. The boys and girls realize that they will only escape if everyone does what he or she does best." Silke Schnee lives in Germany with her family. If I'm understanding her wording in the book, it sounds like maybe the special needs kids in Germany are still in separate schools instead of being in the "normal" elementary schools, as she calls them. In our school district, the special needs kids are not kept separate. They are in the classrooms, but then the classrooms have extra teachers. My daughter has been blessed to be a part of these classrooms at least three of her five years in elementary school. She enjoys getting to know the kids and helping them. 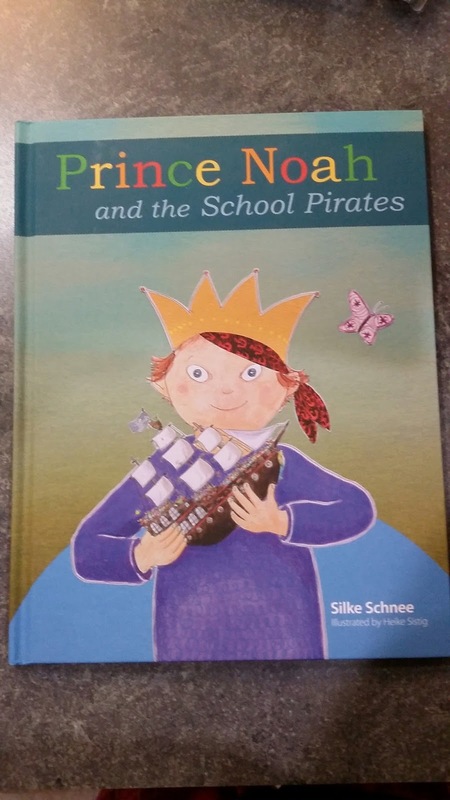 In Prince Noah and the School Pirates, the kids all start off on their own ships. The girls learn "girl" things, the boys learn "boy" things. The kids with eye patches learned by hearing and feeling with their hands. The kids with only one leg learned things at day, but were bored at night. The girls were bored learning only "girl" things. The ships came upon a storm and they ended up in Pirate territory. The Pirates took all of the ships and locked the kids in a tower~~all the kids~~boys, girls, kids with one leg, kids with eye patches and the kids who learned slower. Every kid has their own talents and all of the kids work together with their own unique talents to escape from the pirates. They escape and find that there is only one ship. From then on they always learn on one ship together and nobody ever got bored again. We enjoyed reading the story. Because of the fact that we already incorporate all types of children into our education system, in the beginning of the book I was wondering why all the children were on separate boats. It was a cute story though, about how all the kids used their talents to work together and how incorporating children with all kinds of levels and needs can benefit everyone involved. 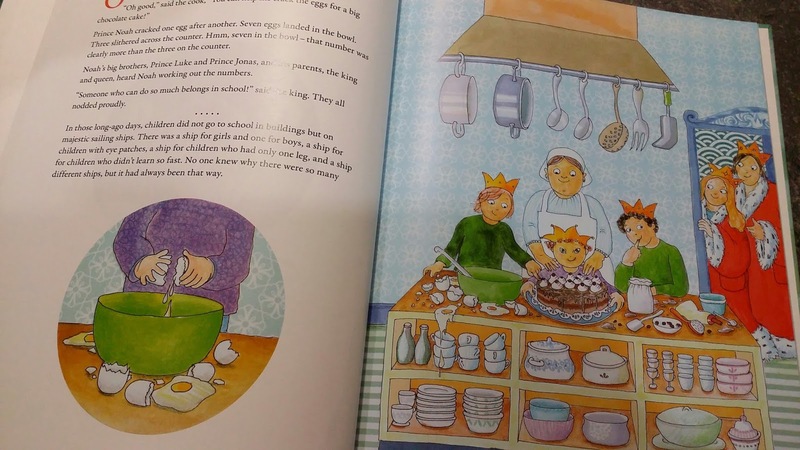 The illustrations are bright and colorful and really help bring the story to life.